The STAC6 represents the latest developments in stepper drive technology, incorporating advanced features that will derive the highest performance from today’s stepper motors. Its Anti-Resonance and Waveform Damping control algorithms make it a clear market leader. The "-S" models are step and direction drives, compatible with PLCs which feature high-speed pulse output, such as our ELC-PLC series and OCS XL series. 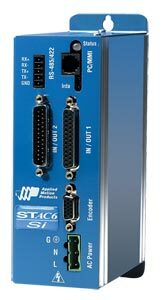 The "-Si" models are stand-alone programmable drives which are programmed with the simple-to-use Si Programmer software. Both the "-S" and "-Si" models can be controlled by sending serial commands in a simple ASCII format, the Si Command Language (SCL). SCL allows for control via serial commands sent from a host device such as a PC or PLC. This permits the user to perform a variety of motion, I/O, and system status tasks in real time via a host serial device. Torque Ripple Smoothing: All step motors have an inherent low speed torque ripple that can affect the motion of the motor. By analyzing this torque ripple the system can apply a negative harmonic to negate this effect, giving the motor much smoother motion at low speed. NOTE: Power cord not included. See Accessories below to order. Note: Programming/configuration cable included. Software is a free download; click on "Software" icon below the picture. To see torque-speed curves for recommended motors, click on "Specs" above.